"As I walked out one evening..."
Auden's line so disarmingly simple (in conjunction with the beauty of such stunning Night Sky sights) -- Johnny and I caught a glimpse that Moon coming out of Ironworks (the climbing gym) at the foot of Ashby about 6:15 last night, the planets not yet 'out' -- will look for them tonight. . . I saw the full show just an hour and 20 minutes later, from four miles to the north of where you and Johnny were, looking west toward the bay, the faint crescent moon just rising, and above it, in a perfect line, Venus and Jupiter, very large and bright.
. . . "the milky way smoldering on the horizon." That got my attention! Thanks for bringing all this together, Tom. Beautiful. I'll be looking west at twilight tonight. Eleni and I saw this grouping--Venus almost horizontal with the Moon on its right, Jupiter above Venus in the western sky over the Ithomi mountains early last night on our way to a carnival celebration in one of the villages overlooking the upper Messenian valley. Thanks for pointing this out. How cheering to have some company in stargazing. But no wonder. This is the oldest branch of astronomy and dates back to antiquity. How fitting. Last night the moon was well up and out of the alignment by the time I negotiated the dark steps for a look. 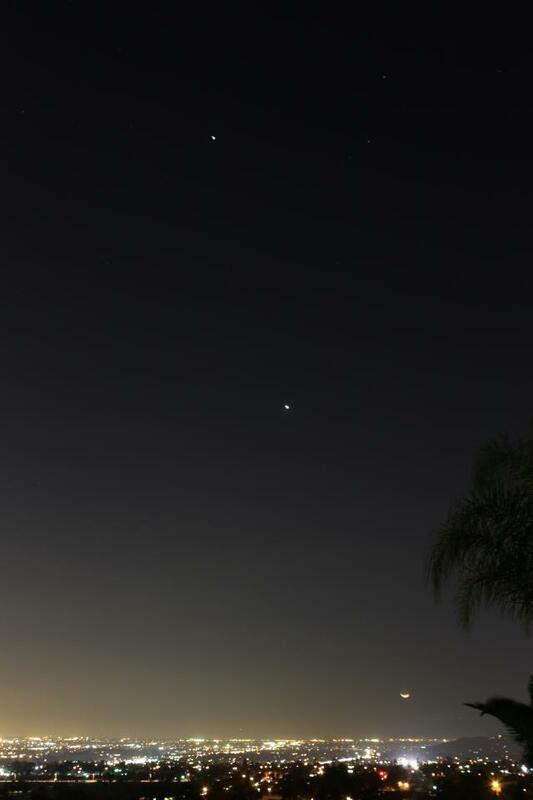 But Venus and Jupiter were still up there and doing quite well, thank you very much. It seemed good fortune to be able to be seeing any of this at all, given a large and deep Arctic trough e'en now bears down upon us from the Gulf of Alaska, threatening to occlude everything and drop the temp 30 degrees in a matter of hours. In the ongoing who-shall-survive-longest sweepstakes which is what remains here of the infinite game there is currently some concern for one of our cast of agéd and infirm, a dear little girl cat who has suffered through plenty of foul weather in her time but is doing poorly now and one fears for her. For which reason Susan's interpretation of the astronomical conjunction as lucky was gratefully received. Smoulder on, then, crazy Milky Way, above Tuxedo and above Roanoke, above the villages of the upper Messenian Valley and the chalkdust-smudged, haole-haunted, weekend-darkened classrooms of the Sandwich Islands! We thank our lucky stars that you did ("go in search of evidence of this extremely rare astronomical event"). I saw it again last night, also from the East Bay -- driving home along the freeway after my brother's performance of "PIANO GIANTS / from Bach to Gershwin," featuring some of the Preludes and Fugues (after John Lewis' playing of them), Monk's "'Round Midnight," Wynton Kelly's solo on "Freddie Freeloader" (from Kind of Blue), Monk's "Pannonica," something from Moussorgsky's "Pictures," Mary Lou Williams' "Roll 'Em," and Willie 'The Lion' Smith's "Relaxin'" -- and then that moon smiling as it went down in the low western sky, Jupiter way above it now (or was it Venus?). . .
Steve, as this positional astronomy appears to be largely a matter of perspective, here's another angle of view, from our friend Artur -- a brilliant look, in the deep blue Northern night, at a crowning Norwegian Appulse. 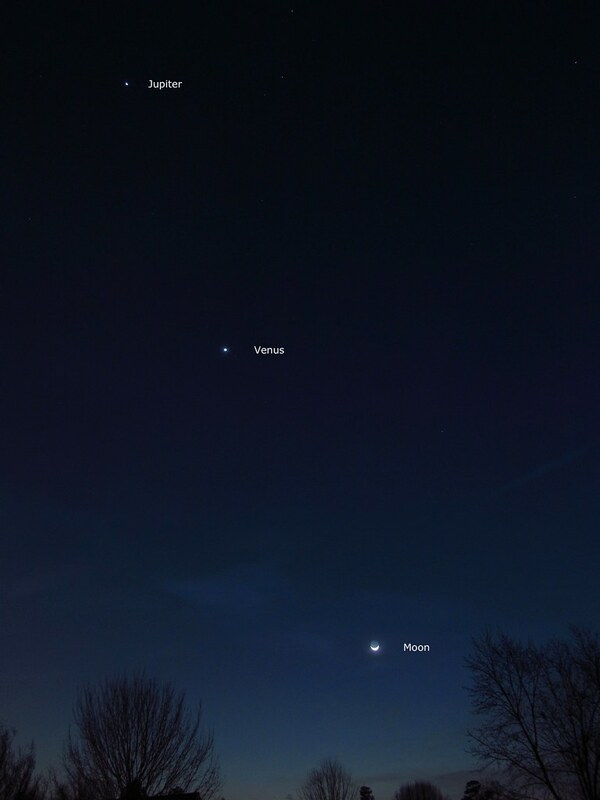 I noticed this in Connecticut last night, except that Jupiter was above, Venus below, and the moon to the right, so it was more a triangle. Really beautiful. The show changes every night, now we too are seeing that triangular conjunction Tom describes.